Border protection is front and center in the news these days. Because my work as the publisher of Vermont’s Northland Journal, a magazine dedicated to sharing and preserving the history of the Northeast Kingdom, including the border region, I have always had a great relationship with the U.S. Border Patrol even when I disagreed with ever-changing federal policies relating to the border . Yesterday (Saturday) my wife, Penny, and I attended a retirement party for the commander (Agent in Charge) of the Newport station of the Border Patrol – Fernando Beltran. For those of you who don’t know, the Border Patrol patrols the border region. They aren’t the officers stationed at the ports of entry. I met Fernando soon after he arrived on the northern border in 2005 after a life on the Mexican border. We became friends. I taught him about the history and culture of the border region, and he provided me with insight into the work of the Border Patrol. He was also a periodic guest on my radio and TV show. In many ways, Fernando’s story is an American success story – from migrant farmworker, to a seasoned veteran of the U.S. Border Patrol. Steve Henesy is the new Agent in Charge of the Newport station. The following is an article I wrote about Fernando several years ago. Border protection is front and center in the news these days. Because my work as the publisher of our monthly magazine, Vermont’s Northland Journal, a magazine dedicated to sharing and preserving the history of the Northeast Kingdom, including the border region, I have always had a great relationship with the U.S. Border Patrol, even when I disagreed with some of the ever-changing federal policies relating to the border . Today Penny and I attended a retirement party for the commander (Agent in Charge) of the Newport station of the Border Patrol – Fernando Beltran. For those of you who don’t know, the Border Patrol patrols the border region. They aren’t the officers stationed at the ports of entry. I met Fernando soon after he arrived on the northern border in 2005 after a life on the Mexican border. We became friends. I taught him about the history and culture of the border region, and he provided me with insight into the work of the Border Patrol. He was also a periodic guest on my radio and TV shows. In many ways, Fernando’s story is an American success story – from migrant farmworker, to a seasoned veteran of the U.S. Border Patrol. Steve Henesy has been selected to fill the position left vacant to Fernando’s departure. The following is an article I wrote about Fernando a few years ago. Fernando Beltran is on the hunt. He turns his Chevy Tahoe from a main road in Holland, Vermont, onto a narrow, winding dirt road that runs along the Vermont–Quebec border, a road that many people probably don’t even notice as they speed past. Although deer and deer hunters are a common sight along the rural, forested border region, Beltran is not hunting for deer. Instead, he is hunting for drug smugglers and other people trying to enter the United States illegally. He is a United States Border Patrol agent. “One of the things about Vermont is almost wherever you look there is a view,” Beltran said as he pulled to a stop to watch two young bucks cross a field in Holland. Beltran isn’t just any officer; he is the agent in charge of the Newport station of the Border Patrol. 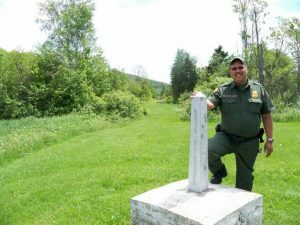 He supervises the officers who patrol a 30-plus mile section of the Vermont–Quebec border, a section of border that includes much of the international border region of Orleans and Essex counties. They also take part in missions as far south as Brattleboro, Vermont. A burly, easygoing man, Beltran leaves no doubt he is a proud, patriotic American who loves his country. He sees his decision to join the Border Patrol in 1985, after a three-year stint in the United States Army, as an extension of his love for the United States. The Border Patrol is the patrol branch of the United States Customs and Border Protection (CBP). Its mission is to patrol and protect the country’s borders. The station Beltran heads up is one of eight stations that makes up what is known as the Swanton Sector that extends from Beecher Falls, Vermont, to Ogdensburg, New York. He does not supervise the American ports-of-entries that are located at entry points into the U.S. within his patrol sector. Those are overseen by a port director. “The Swanton sector usually leads the rest of the northern border when it comes to apprehensions,” Beltran said. Those apprehensions include, but are not limited to, capturing illegal immigrants and drug and human smugglers. And since the terrorist attacks of September 11, 2001 there is a heightened awareness that terrorists and others who wish to do harm to the United States could slip into the U.S. across the northern border as well as the Southern border. Nobody who works to protect the border has had it easy since the attacks and Beltran is no exception, especially since he took charge of the Newport station in 2005. Because of the attacks many changes have come to his sector and the rest of the northern border, most notably the tightening of the border, and border crossing regulations. Beltran said, “9-11 changed the world for all Americans.” Some of those changes have not come easily for Americans, especially those who live in the border regions. This is no exception for the people of the region along the Vermont–Quebec border. Border security was almost immediately tightened following the attacks, and security has continued to tighten for the last nine years since then. Gone are the days when two communities on both sides of the border—communities such as Derby Line, Vermont, and Stanstead, Quebec—could operate as one community. And gone are the days when local residents could cross the border with a wave of a hand and a smile at the friendly officer waiting to greet you back into Vermont on a trip home from Quebec. Side streets that cross the border in Derby Line, streets that had been used by locals for generations, have been gated off to cross border traffic. Not only is a friendly wave not enough to get Americans, including locals, back into their country at the ports of entries, but they, and everybody else, are expected to have a passport or a special enhanced driver’s license as a means of proving their identity. Then there are the numbers of lawmen who now patrol the Vermont side of the border. The number of Border Patrol has multiplied. Earlier this year a federal program called Operation Stone Garden enraged many villagers in Derby Line when their community was saturated with lawmen, some of them rented from other police agencies from around the state. The official stance was the operation was to prevent terrorists and other bad guys from slipping into the United States. They noted that while life in the village of Derby Line is largely peaceful, there is a darker side of life along the border, including illegal aliens crossing the border and murderous drug gangs who slip their illicit cargo across the border. However, many villagers and other locals saw little connection between the stated mission of the program and them being stopped, and some people insist, harassed, for minor traffic violations. Others insisted they were stopped for no reason at all except they were going about their lives in a border community. Most people understood that the officers and local border officials were not to blame for the changes in the border laws. Those changes arose out of Washington, D.C. However, complaints were aired about a handful of lawmen accused of using heavy-handed approaches to enforcing laws along the border. Most of these complaints focused more on local police departments from around the state hired to patrol the border region during Operation Stone Garden than on the federal officers. Some people insisted the U.S. government had laid military-like siege to the quiet village. Ironically, some of the harshest criticism has come from former federal lawmen who have insisted that some of the new border laws are unnecessary, even counterproductive. They have been particularly critical of the way some lawmen and some of the men and women who work at the U.S. ports of entries are treating border crossers. Tempers have sometimes flared at a number of public meetings designed to ease tensions and try to bring some sense of normalcy to the border communities. Even members of the Derby Line Trustees were critical of some of the changes the border laws and enforcement. These meetings attracted members of the public from both sides of the border. Political figures such as U.S. Senators Patrick Leahy and Bernie Sanders, both who hail from Vermont, even stepped into the fray in an attempt to bring sense to the new realities of border life. Speaking about his agents, he said in no way condones unprofessional conduct by them and if anybody thinks they have been treated disrespectfully he wants to know about it. He said it’s important to notify him immediately and not days or weeks later so he can investigate and resolve the matter. As for concerns that arise at the border crossing, Beltran suggested that arising at the U.S. ports-of-entries people need to contact the appropriate port officials. However, although he is sympathetic to the people’s concerns, and the historic use of the now closed side streets, Beltran said there really was no choice, noting that the times have changed in more ways than one. It’s true that for many years locals used those streets responsibly but, he said, because of the internet, aliens, alien smugglers, and drug smugglers from around the country know about those unguarded streets. “We had people from as far away as Colorado and Florida try to cross here,” he said. Many learned about the streets on the internet or on the news. Beltran noted that the unguarded streets are located off of a 700-yard section of road between two manned ports of entry, ports that people can use in place of the unguarded streets. One could say the journey of the father of three to his current position is a story of an American dream come true. His father, a Mexican American, was born and raised in the Rio Grande Valley of Texas, and his mother, who passed away in November, immigrated to Texas with her family when she was 11 years old. They were migrant farm workers when they met at a dance. After marrying they continued their travels throughout the Midwest and West with other migrant workers, laboring in the farm fields and orchards. “As a migrant farm worker I grew up all over the country,” he said. “Our base was always Texas.” He quickly listed off some of the states where he lived and worked while growing up: Oregon, Washington, Wisconsin, Minnesota, South Dakota, North Dakota, Ohio, and Indiana. Fernando said his family picked cucumbers and tomatoes in Ohio, cherries, apples, strawberries, and asparagus in Oregon and Washington. They also hoed beets in Minnesota. And they worked in sugar beet and soybean fields in the Dakotas. The work was all done by hand. Many of the fields consisted of hundreds of acres. Sometimes the workers, many of them Hispanic, traveled in caravans of cars and trucks. Upon arrival in the region where they were to work they sometimes spread out to live on individual farms. Other times they lived in work camps that consisted of between 35 to 40 homes. Among the migrant workers, in addition to his parents, were some of his uncles, aunts, and cousins. Some of the families had been working the same farms for generations, Beltran said. For example, when he was growing up his family worked on one farm in Halstead, Minnesota, that his grandfather had farmed. The family traveled the country from the spring throughout the summer, and into the early fall, but then they returned home to the Rio Grande Valley so the children could attend school. Because of the large number of children of migrant workers, Beltran said the school schedule was different than their non-migrant peers. The school schedule for the children of non-migrant workers often went from September to June from 8 a.m. to 3 p.m. A typical schedule of migrant workers extended from October to May. To make up for the shortened school year, their classroom day went from about 7 a.m. to 5 p.m.
Beltran said while many of his non-migrant worker friends and classmates looked forward to the weekends and vacations during the fall and winter months, for him and other children of migrant workers, those days off meant more farm work. They traveled around Texas picking grapefruits and onion Another downside of being the child of migrant workers was, because of their adjusted school year to accommodate their work, they were seldom able to take part in extra-curricular activities. Besides that, he said many parents felt if their children had enough time for such activities they might as well fill that time up with work, not play. Life as a migrant worker wasn’t always easy, but Beltran said he, his family, and most of the other workers were proud of their work. However, he said there was a downside to this lifestyle: discrimination was a fact of life. People of Hispanic descent are the majority in southern Texas, but that is not the case in some parts of the country where he and the other workers traveled. They sometimes suffered subtle racism. Sometimes it wasn’t so subtle. “There were signs at some truck stops saying ‘We don’t serve Mexicans,’” Beltran said. As the oldest of the couple’s four children he knew what the signs meant but his sisters didn’t. “What do those signs mean?” Beltran remembers his sisters asking their parents. “It means they don’t serve Mexican food,” Beltran said his father told his sister. “The signs don’t mean that,” he recalls butting into the conversation not knowing that his father was trying to protect his sisters from this terrible example of racism. “My dad wanted to shield them from that stuff,” Beltran said. Although his parents were proud of their work as migrant farm workers, Beltran said they wanted better for their children. They didn’t want their children to labor their lives away, traveling the country chasing crops. Not only did he graduate from high school, so did his sisters. Some even went on to college. Beltran is obviously proud of what his little sisters have done with their lives. However, in saying that, he makes it clear that he has total respect, and even admiration, for migrant workers and other people who make their living off the land. Beltran uses his family’s experience as migrant workers to debunk the reason some people give for allowing undocumented immigrants who sneak across the border to work in the United States. In 1980 he joined the U.S. Army, but only after the season’s farm work was completed. He explained that he waited because of his dedication to his family and the only work he’d known until that time. Following a three-year hitch in the Army in which he served as a combat medic, Beltran returned home to the Rio Grande Valley of Texas. He joined the Border Patrol in 1985. Recruits must complete five months of training at the Border Patrol Academy in Artesia, New Mexico, before patrolling the country’s borders. During this time recruits learn to become lawmen. In addition to undertaking physical fitness training, they study criminal, statutory, and immigration law. The academy teaches the recruits the basics of being a good agent. However, Beltran said much of the finer details of patrolling and tracking are learned on the job working under the watchful eyes of veteran officers. For that matter, he said, good agents never stop learning because people who are trying to sneak into the country never stop learning and developing new ideas. “I had a lot of good role models,” Beltran said. “I learned a lot from them.” He added that he continues to learn not only from his superiors, but also from those he supervises. Before coming to the northern border in 2005 Beltran patrolled the U.S. Mexican border, climbing through the ranks of the Border Patrol. His first duty assignment was in Yuma, Arizona. He has made too many apprehensions to count and seen too much death to even want to think about. Many of the dead were people who were trying to enter the country illegally and who died because of exposure to the elements. Others died at the hands of the people who were smuggling them. And yet others died in the cross border drug wars that continue to rage along the southern border. The agent said anyone who hasn’t patrolled the southern border, or who hasn’t lived there, cannot fully imagine the gang violence, often fueled by drug smuggling, which occurs just across the border in Mexico. It is violence and bloodshed that flows across the border into the U.S. Some people would have you believe that the people trying to enter the country are coming here to experience the American dream, he said. In some cases that might be true; however, he said mixed among them are drug and human smugglers. And just maybe there is a potential terrorist. As for the people who want to come to this country to live and work, he said they should do it legally as his mother and her family did when they immigrated here. Even before the terrorist attacks most agents took their jobs seriously, Beltran said. However, he said the attacks made their mission even more important. “We were attacked on our own turf,” he said. “Nobody knew what was going to happen next.” Was another attack coming? In the hours following the attacks many Americans wanted to be near their families fearing another attack was imminent. However, for many Border Patrolmen, including Beltran, being near their children wasn’t in the cards. It was their job to help assure another attack didn’t happen. Beltran was temporarily, and almost immediately, reassigned to Dallas, Texas, leaving his wife and child behind during a terrifying time. When thinking about his wife and the sacrifices she has made for him and his career, he said he thinks about the saying, “Behind every man is a good woman.” He said not only was there a good woman behind him, but a great wife and mother. In addition he credits his children for their willingness to move when his career and his country required it. “As long as the family was together they were okay with it,” Beltran said. During his last assignment before he came to the northern border, he was a field supervisor in Laredo, Texas. He supervised 180 agents. “I was ready for a new challenge,” he said. His friend and fellow agent, Gary Viens (a native of Newport, Vermont who has since retired from the Border Patrol), encouraged him to consider moving from the southern border to the northern border. That conversation was the beginning of his decision to relocate his family to the Northeast Kingdom and begin a new chapter of his life in the Border Patrol—guarding the Vermont–Quebec border. Beltran wondered if his children would suffer racism in Vermont, one of the whitest states in the Union. “When I came up here I was worried they’d have the racism I saw when I was a kid,” Beltran said. “But when we came here the people of Vermont were the friendliest people. Everybody we have run across has been warm and welcoming.” For that matter, he said it is the only state where he and his children have lived where they have never experienced racism, noting that people in Vermont accept people for who they are. Beltran kept it no secret that there was an adjustment period for him when he arrived on the northern border. Though there are far fewer apprehensions on the northern border than on the southern border, Beltran said that doesn’t make their jobs any less important. “There is no telling what we’re going to run into,” he said. “We can have days on end where we don’t catch anybody. There is no telling what will happen each day.” Besides that, he said, far more goes on along the border than many locals know. He said although it is far from the U.S.–Mexican border, it is a drug and human smuggling route. People from 111 different countries were caught coming across the border in the Swanton sector last year, some of them with extensive criminal records. Beltran also credits the people of his patrol region for welcoming him to this beautiful corner of the world—a forested, mountainous paradise that for him proves there is a God. Many of them have taught him things about the region that only people who had lived here all their lives would know. Although the border has electronic sensors and other technology to detect illegal entries, Beltran said that technology is no substitute for the thousands of miles he and his agents patrol along the border each year. Most of all, he said they couldn’t do it without the help of the border residents—the eyes and ears of the border. Remember those tension-filled meetings in which sometimes even the Derby Line Village Trustees took him and other government officials to task for some of the new laws and how they were being enforced? Those are the same trustees who sent him a sympathy card in November when they got word that Beltran’s mother, the woman who had encouraged him to dream, had passed away.